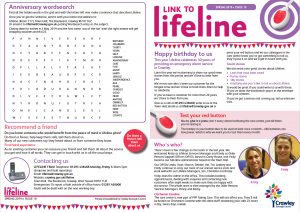 We thought you would like to know that Crawley Borough Council can proudly say that it has been providing the Lifeline service for 30 years now, through the highs and lows of the economic cycle; it is good to have positive news to share with you. Please see below our annual newsletter, please be aware that for a limited time you can receive the service for 13 weeks free of charge for any reason e.g. fear of crime, health concerns, safety issues. This entry was posted in Crawley Borough Council by admin. Bookmark the permalink.